I love letterpress. I love the indentation it makes on the paper and I love the simplicity of the process. It has remained virtually unchanged since Gutenberg's press from the 1400s. Letterpress came back into fashion in the late 1990s and the trend is still going strong. With its bold colors and simple lines, I think it's the best printing method on the planet. 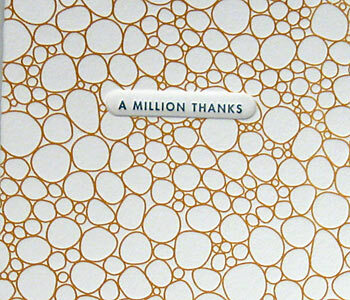 If anyone would like to donate a letterpress in my general direction, thank you, that would be great. I will be at your house in the morning. Egg Press has a letterpress of their own and the know how to use it. 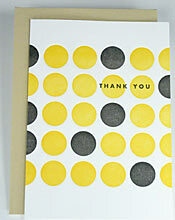 I love the bold circles from the first card and the delicate lines on the second one.